Colour is usually recorded using the «Munsell» colour chart system. Use the Panetone Colour Chart to identify colour of pottery pieces. Decoration = Technique of application of decoration be it incised into the surface or applied to the surface. Glaze = Glassy, vitreous coating on either the outside or inside of the pottery piece. Maker’s Mark = Is there a stamp or mark somewhere on the item (usually the base) indicating the maker or pottery workshop. Paste = The material that the clay fabric is made from. Shape = Cylindrical, ovoid, sphere, ellipsoid, hyperboloid or cone. Hardness = Use the»Moh’s» Scale of hardness – generalization may be necessary here. Inclusions= what materials are included in the pottery to strengthen – see cross section of your pottery sherd before you restore the item. Core Colour = Is the cross section of a pottery sherd – even/uneven in colour? 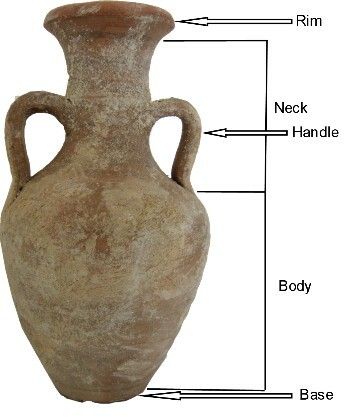 What does this indicate about the pottery? 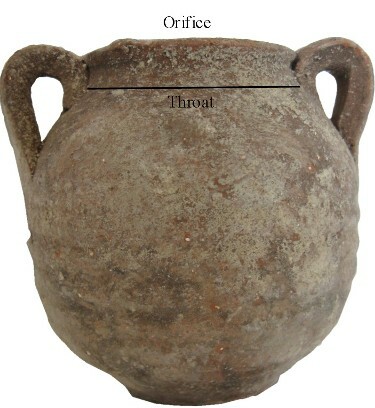 An uneven colour usually indicates that the pottery piece was fired at a lower temperature, possibly even in a pit kiln. Is there a slip, wash or glaze applied to the pottery? If this applied to decorate or protect the pottery? under Claudius in the first century AD. 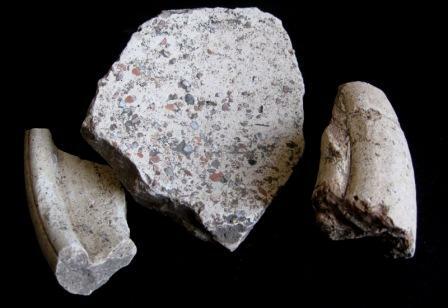 Coins from the reign of Caesar Augustus have been found with this pottery. 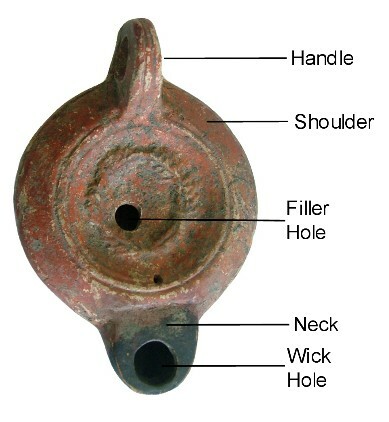 A mortarium was one of a class of kitchen vessels from the Roman period. They are mostly hemispherical or conical bowls, and usually have heavy rims often with ornate «ogee» style edges, and with coarse sand or various grits embedded into the internal surface. They were used for pounding or mixing foods not unlike a present day mortar and pestle and are an important indication of the spread of Roman cooking styles across the Empire. Stamps on some early Roman mortaria record the name of the potter, from which it is possible to trace their movement between the pottery workshops. Above you will see 3 pieces of a Roman Mortarium from a Roman fronteir fort of the first century, they are not necessarily all from the same original. The centre piece shows a major portion of the base and is a good example of the coarse grits that were embedded into the surface as an aid to the grinding of the food. A question studnets should research in a case like this is how would a person in ancient times use this mortaria? Would it be used with an elongated pestle and pounded or would the food be «rubbed» in a circular motion making full benefit of this gritted surface. They could research what types of cooking methods were used in the Roman Empire and perhaps even try some Roman recipes. Contact us if you would like some infomation on Roman recipes. Of note should be the shape or the rim, with the pronounded down hanginging lip. THe rim piece on the left is upside down wheras the one on the right is right side up. The pottery is a very hard mix which would be an impoetand requirement in mortaria due to its use. The insertion of the grit into the surface would help create a strong mix not unlike the use of blue metal in concrete today. This insertion of pieces of hard matter such as grit, shell, silicas etc is called the «grog» in pottery making. The piece is a pale buff colour and remains fairly clean or «unstained» from use, though if you examine the surface of the base in the centre you will note the grit pieces are very heavily worn whereas originally they would have protruded above the surface toi create the grinding function. In 1812 the Mohs scale of mineral hardness was devised by the German mineralogist Frederich Mohs (1773-1839), who selected the ten minerals because they were common or readily available. The scale is not a linear scale, but somewhat arbitrary. 2 Gypsum Plaster of paris. Gypsum is formed when seawater evaporates from the Earth’s surface. 3 Calcite Limestone and most shells contain calcite. 4 Fluorite Fluorine in fluorite preventstooth decay. 5 Apatite When you are hungry you have abig «appetite». 6 Orthoclase Orthoclase is a feldspar, and in German, «feld» means «field». 8 Topaz The November birthstone. Emerald and aquamarine are varieties of beryl with a hardness of 8. 9 Corundum Sapphire and ruby are varieties of corundum. Twice as hard as topaz. 10 Diamond Used in jewelry and cutting tools. Four times as hard as corundum.